You get an update, you get an update, everyone gets an update! All Epics are now more epic! Some Base Crusaders gear functions have been changed! And some more Base Crusaders should now be viable DPS options! About the GameCrusaders of the Lost Idols puts players in charge of a band of fighters set in the fantasy world. Their mission is to form a mighty group of adventurers to take on waves of enemies as they rid the world of evil-doers, bad guys, terrible T-Rex, irritable escargot and Panda Claw. Yes, that’s right, a giant panda with lobster claws. Crusaders of the Lost Idols is the only idle game to include a strategic formation feature, as players must now learn to master the art of organising their motley band into the most powerful formation possible. The position of each fighter next to his or her companions will have a significant effect on their attack strength. 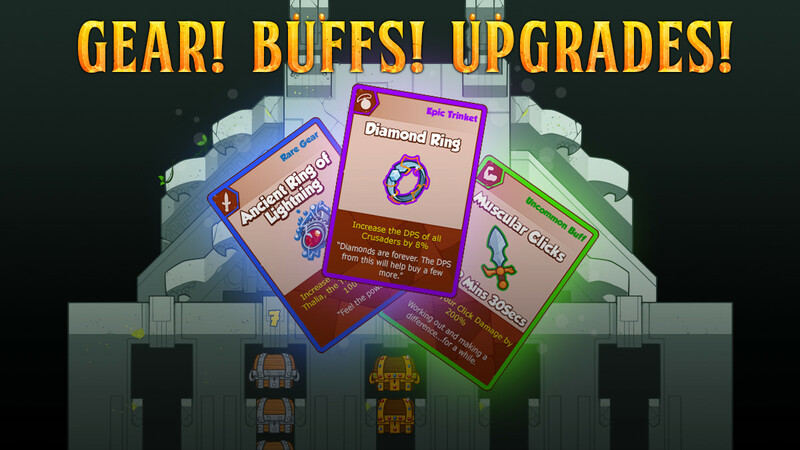 Combined with equipped buffs and upgrades this unique feature adds layers of deep complexity to the idle genre. The only Idle Game to feature a formation system. 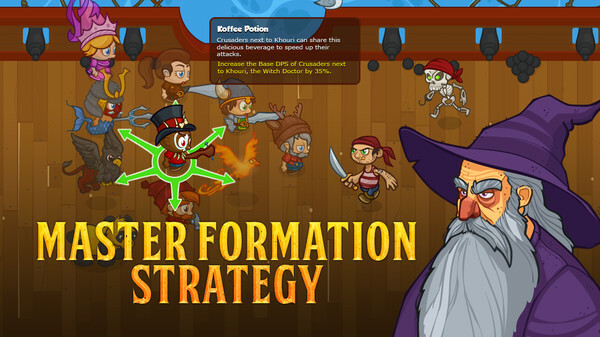 Unique character abilities, buffs and gear challenge the player to find the best formation every campaign. Colourful characters, some based in the broader world of video games. A host of in-jokes abound for the attentive gamer. Deep playability and challenge split over four campaigns and 33 objectives with more campaigns and objectives released monthly. A cornucopia of deep content awaits the player. Unique upgrades by character coupled with special gear and buffs demands players learn their strengths and weaknesses to succeed. 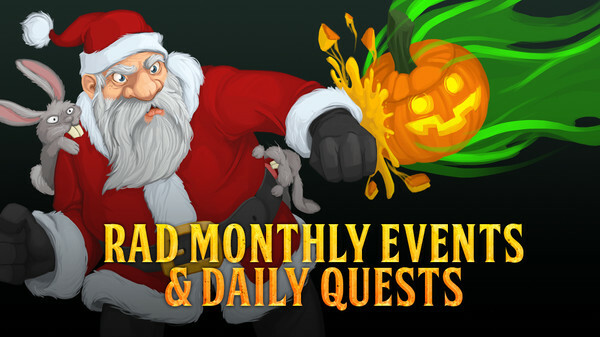 Every day players are challenged with mini objectives that will reward them with precious red rubies once completed. Quest objectives include everything from using certain abilities a set amount of times through to killing a predetermined number of monsters. Regular limited time events featuring special objectives and exclusive new content. 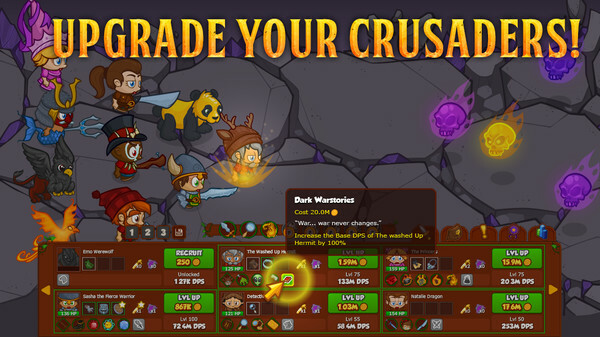 Crusaders of the Lost Idols is one of the many clicker and idling games that you can find out there, but the thing that makes it special is surely the uniqueness that it delivers to the entire experience. You see, this is not a simple clicking game, it actually has a story and you do need to work hard in order to find the lost idols as well as eliminate the enemies that come in front of you. The idea is simple, you have one or multiple characters that need to eliminate the endless enemy threat and all you have to do is to make sure that you accumulate the money you need in order to do upgrades and level up your characters. The more you do this, the better your characters will become so you do need to play as much as you can in order to improve their capabilities. This is the major strength of Crusaders of the Lost Idols, because it always manages to bring in front a really neat gameplay without making the experience complicated. Instead, once you enter and start playing the game you will get addicted to its interesting yet simple mechanics that you have to follow. There are multiple level types to be had in the game world and each one does have its own value, so it all comes down to you to harness their power and potential in order to get the best experience. Rest assured that playing Crusaders of the Lost Idols will not be easy at times, because enemies are becoming more and more powerful so you have to do all you can in order to generate the best results, that’s for sure. With that in mind, you have to devise strategies. And since the currency will not be enough, you will need to see what play style works for you best and then upgrade it to get the best experience. It might not look like much at first but the experience will be well worth it so you should definitely invest your time in getting this done properly. Positioning is essential in this game and that’s one of the things that sets it aside, which is always a nice touch that delivers great potential. Graphics are quite impressive considering that this is a free game, and the animation quality is good as well. The game does a really good job when it comes to delivering a nice attention to detail and in the end it can definitely pay off, which is what matters the most. I played this game for quite some time now and I found it to be the thinking man’s idle game. It’s not only about idling and clicking, it also requires strategy and attention to detail, which in the end can really add up to a fun experience. The strategic opportunities and pure fun gameplay will always make you come back for one more turn. This is an amazing free game, well worth the time you want to place into it!